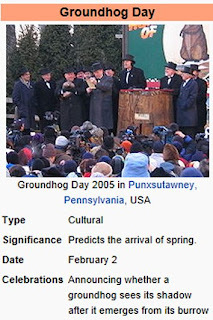 AllThingsDigitalMarketing Blog: Happy Groundhog Day America: Punxsutawney Phil makes his 131st: Sees his shadow and New York's Chuck sees opposite. 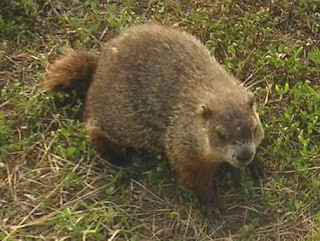 Happy Groundhog Day America: Punxsutawney Phil makes his 131st: Sees his shadow and New York's Chuck sees opposite. At 7:20 am today at Gobbler's Knob, Punxsutawney Phil did see his shadow which means we can expect 6 more weeks of winter. Although New York's friend had no shadow which means an early spring. Occurring every year on February 1st, 2nd or 3rd , dates for the entire celebration begin February 1st - February 3rd, and Punxsy Phil will predict what the next 6 weeks of weather will be. The Stormfax Weather Almanac reports Punxsutawney Phil has seen his shadow 100 times (as of last year 2014) which equates to 101 times this year (2015), no shadow 16 times with no record 9 times. Groundhog day in Staten Island is sponsored by Time Warner Cable and garnered with trumpets to wake up the little Staten Island's very own woodchuck, "Chuck," as the Staten Island Zoo opens its gates at 6:30 a.m. on Feb. 2.